Did I tell you that I'm looking for a new cell phone? The last phone B got me as a gift is no longer functioning. I dropped my pretty pink Nokia several times; all times unintentional and due to my clumsiness. So the last drop was the last straw and the screen went completely blank. I tried reviving my phone to no avail and now, I am back to using my old phone, Nokia 7270. It works fine but not perfect and the battery is reaching the end of its usable life already so a new cell phone sounds pretty reasonable to me. I did a little window shopping online last night and I have my heart set on this beautiful new N97! Isn't it gorgeous? The Nokia N97 comes in black and white and I'm definitely gearing towards the latter even though black tends to remain looking new for much longer. Designed for the Internet-savvy consumers, the Nokia N97 combines a large 3.5" touch display with a full QWERTY keyboard. With this new phone by my side, I'd be able to experience the full power of the internet with fast WLAN and HSDPA connections. I can easily set up my email and connect via Gmail. The full keyboard makes typing messages easier and faster so it all looks good to me so far. Of course, a new phone calls for new wireless phone accessories. I've already purchased some really cool Disney charms while vacationing in DisneySea but I am also looking for a nice leather case. 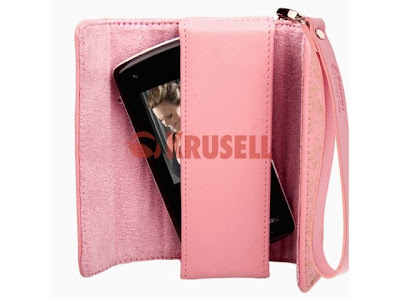 So I visited this really amazing site that offers all the best wireless accessories for cell phones and chanced upon this very elegant pink leather case made especially for a Nokia N97. It also comes in white, black and brown but pink is definitely my choice! I already have the phone model in mind and the right accessories to go with my new phone. The only thing missing right now is the phone itself. Recommended retail price for the N97 is RM2480 so it's not exactly a cheap mobile phone but the heart wants what it wants and all I can think of right now is this shiny new phone! Looks like I have to work even harder than I already am to make sure this shiny new phone and all the beautiful accessories that come with it belong to me by the end of the year. Wish me luck! OMG! 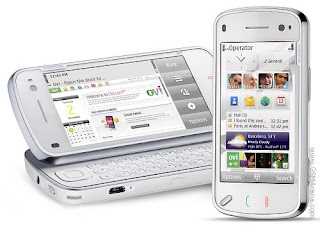 I love this kinda of phone.. the type that opens up with the keyboard like that.. though no likey the communicator.. I was eyeing the LG one as seen on Gossip Girl but this one is gorgeous! Did I by any chance get to chop? Yay, me too dearie!!!! Cause can use like a tiny lappy like dat, type away on the keyboard! But expense kan 2480…sigh….. I haven't decided yet but they all look so good and all have great specs I am torn!! have a wonderful wednesday Marzie! Yay! I love this phone Mon, must find money to buy! Abaden! Sure la pink is my choice, although….I do like the white case too! got your greetings so I just want to say hi too! I am la Tekkaus but no money how la to buy now? LOL! is this is a hint? hahaha. Gulp! Nice phone marzie! last nite at dinner, the couple beside me was using this phone. The girlfriend punya is different, but jenis slide to the side like this, but the bf was using exactly this one. Macam best tgk.. but masa hari tu got nokia showcase at klcc.. macam not too fond of the keypads.. but definitely a gorgeous phone. Ha ha I just got my phone Shemah woo hooo! Tak yah spend so much to enjoy all the great features too so it’s all good here yahoo!